Cher is not reluctant to put her own name in the title for TV tributes to others, as she doubly did for 1998’s Sonny & Me: Cher Remembers. Even so, Dear Mom, Love Cher provides ample room for 86-year-old Georgia Holt, who had the then Cherilyn Sarkisian by the first of her six husbands, John Sarkisian. The one-hour documentary film, which is consistently interesting and revelatory, premieres Monday, May 6th at 9 p.m. (central) on Lifetime. Cher, 66, and her 61-year-old kid sister, Georganne LaPiere Bartylak (from Georgia’s third marriage to John Southall), are soon seen on a couch together in a collective convivial mood. Cher occasionally interjects, telling Georgia at one point, “I think we can walk the narrow razor of white trash only so long.” All three then laugh uproariously. Georgia, who double-dipped with two marriages to two of her six husbands, once had a budding acting/singing career that never quite jelled amid the chaos of her recurring man trouble. She was born Jackie Jean Crouch on June 9, 1926 in Kensett, Arkansas. Dad was 21 at the time. 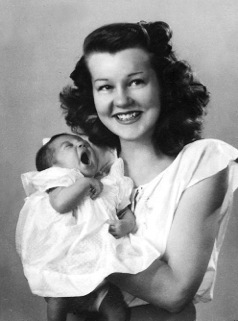 But her mother, Lynda, was just 13. “I’m a child that’s never grown up because I never got to be a child,” Georgia says. She’s still very much a looker with a trim figure and sporting a piled high platinum blonde wig. Numerous adjustments also have been made to Cher, of course. But that’s off-topic in the swiftly moving Dear Mom, Love Cher, which easily could have used another hour. The archival film and black-and-white still photos are terrific throughout, with mom telling tales about her friendship with Lucille Ball, the crush Ozzie Nelson seemed to have on her and how close she came to aborting Cher rather than returning to a miserable marriage. Georgia got as far as a clinic before deciding she couldn’t go through with it. “So that’s how you’re here,” she tells Cher. Georgia also recalls the time she was almost cast in the movie The Asphalt Jungle. But at the last minute, the role went to an unknown named Marilyn Monroe. In 1981, while dating a man 20 years her junior -- Craig Spencer -- she resurrected her singing career at his prompting and recorded a country-western album with former members of the late Elvis Presley’s band. But it was never released until tapes were recently discovered in her garage. As of Tuesday this week, Honky Tonk Woman at last is a reality. It also includes a duet with Cher, “I’m Just Your Yesterday,” recorded in 2011. The film fleetingly showcases Georgia’s still resonant singing voice. “It happened just as it was supposed to,” she says during a current-day conversation with Craig Spencer. They hold hands and seem to be in throes of a perfect Hollywood ending, even though Georgia has never married him. Dear Mom, Love Cher is both a pleasant and evocative way to spend an hour. Once upon a time -- and seemingly all the time -- Georgia and her pre-teen daughters always seemed to be dirt broke. But they made something out of near-nothing, with Cher a household name, Georganne a successful realtor after an acting career in the ‘70s and ‘80s, and Georgia re-blossoming rather than withering on a vine. Her grandchildren by Cher -- Chaz Bono and Elijah Blue Allman -- also appear briefly in the film. “She’s always accepted me,” says Chaz, whose gender transition has drawn more public attention than his mom in recent years. Many viewers might be left wanting more after this very watchable film breezes by. 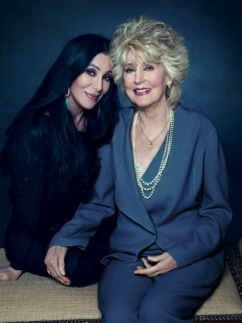 That’s the Old Hollywood way, and Dear Mom, Love Cher makes a virtue of it.